Ever since its June release, I’ve fallen in love with Tekken 7. From the diverse movesets and personalities of the characters to the joy of playing hours of multiplayer matches with friends, it’s a game that I’ve picked up and played here and there for months. The announced season pass finally got some DLC last month in the form of Ultimate Tekken Bowl and some unique costumes, but is it enough to justify a standalone purchase of about fifteen dollars? Tekken Bowl is the wildly popular minigame that was introduced in Tekken Tag Tournament. It’s basically bowling with Tekken characters, and it was oddly entertaining for something that was just another side mode. Now included in the first DLC pack, Ultimate Tekken Bowl is Tekken 7’s next gen equivalent of the minigame. The mode plays as a bowling game should, with ten frames where you line up your character, select your spin and power, and watch them go to town. The physics are well done, and it does make for an entertaining time the first couple instances you play. The bowling alley is filled with different characters in the background, and the whole setting is relaxed, making for a chilled experience compared to the fast-paced action of the main game. I’d like to think that this is an alternate universe where all fights are solved by bowling games. One minor gameplay concern I had was with the power selection; in order to build up strength, you’ll have to time your gauge up by pressing the X button at the right time. However, fully charging it up will cause you to accidentally overcharge, hurtling your character across the lane face-first and acting as a miss. It’s admittedly hilarious the first time around, but this happened more times than I liked and hampered my enjoyment. The character selection is a huge positive here. Every character from the main game can participate in this mode, including the guest character Akuma. Each fighter has a power and spin stat (ranging from D to S+), and these differ among players; lighter characters like Lili and Josie have terrible power but excellent spin, Akuma has a good all-around playstyle, and Gigas has one of the most powerful stats but terrible spin and control. The spin is important as you’ll either need to be lucky or have impeccable timing in order to nail a strike and not inadvertently miss. 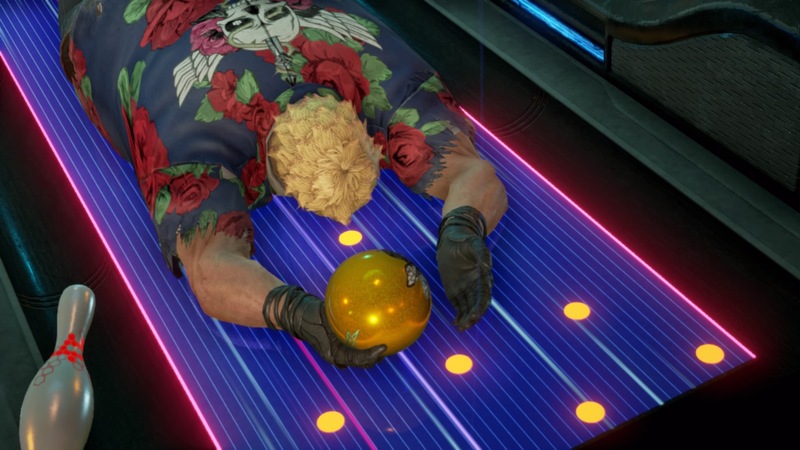 I did enjoy how Ultimate Tekken Bowl captures the essence of the characters, even portraying their win or lose poses based on whether you get a strike, spare, or gutter ball. It’s a bit cheesy seeing Devil Jin shoot lasers when winning or Bob holding his head down in shame when missing, but for some reason it’s also endearing. What I didn’t enjoy was how shallow the whole experience is. There are only three ways to play: 1 player mode, 2 player mode, and Striker mode. Striker mode is a bit interesting: You have a limited amount of throws with which to start, but getting strikes means adding more throws, extending play.. These are punctuated in between by different sorts of split frames you’ll have to hit in order to gain more balls, so it’s not a static challenge. However, other than that, your standard 10 frame modes are all that’s left. Since you only get the default bowling alley to play on (plus a neon lit variation should you happen to get strikes), the novelty wears out quickly. You can play with pins shaped like Heihachi Mishima’s head also, but that seems more of an afterthought than anything else. With no customization options and one venue, you’d think multiplayer would be the saving grace for this, but even that’s pretty limited since the mode only supports local play. It would have been cool to have tournament styled matches ala the online mode of the main game, but alas, this is not the case. There are no other modes here, which is a shame since there are a ton of different things Bandai Namco could have done to make this a fleshed out mini game worth the $14 admission price. It’s still fun to play with friends, but chances are you’ll be done with this mode in less than an hour after you play. One more thing this DLC adds, however, is the addition of some extra costumes. Some characters have Idolmaster-inspired costumes as well as others (notable Xiaoyu and Alisa get schoolgirl costumes ala the animated movie Blood Vengeance), while the ladies get swimsuits and the guys get fundoshi (which is a traditional Japanese loincloth). This is a series that prides itself on its eye candy, and no matter your tastes, these costumes are pretty to look at. It’s a missed opportunity that you can’t use these or your existing customized costumes in Ultimate Tekken Bowl, which could have added even more value to that mode. You can only use the default costume slots, which isn’t as fun as seeing your crazy cosplay ideas come to life. We got some Dead or Alive fights going on in here. Tekken 7’s Ultimate Tekken Bowl is only worth it for season pass holders or die-hard fans of the original Tekken Bowl. Other than some cool extra costumes (which are only usable in the main game), there really isn’t much here to get excited about.